Solve MDPs' equations and understand the intuition behind it leading to reinforcement learning. The model is like a set of rules for a game (physics of the world). Simple: if you're in a deterministic world, if you go straight (a) from the toilet (s), you would go straight (s') with a probability of 1. Slightly complex: can be that you have a probability of only 0.8 if you choose to go up, you may go right with a probability of 0.2. Your potential state (s') is only dependent on your current state (s) if not you will have more s-es. This is a Markovian property where only the present matters. Also, given the present state, the future and the past are independent. They are things you can do such as going up, down, left and right if you are navigating through a box grid. They can be other kinds of actions too, depending on your scenario. 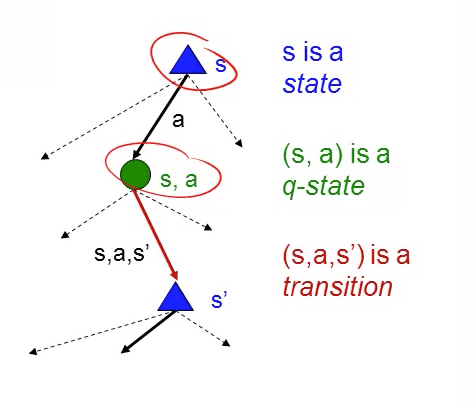 Scalar value for being in a state. Position 1, you'll have 100 points. Position 2, you'll have -10 points. This is basically the solution: what action to take in any particular state. It takes in a state, s, and it tells you the action, a, to take. π* optimizes the amount the reward at any given point in time. Here we have (s, a, r) triplets. You won't know what your immediate action would lead to down the road. You could have done well at the start then worst at the end. You could have done badly at the start then better at the end. Reward for every state except for the 2 absorbing states is -0.01. Each action you take, you get punished. You are encouraged to end the game soon. Minor changes to your reward function matters a lot. If you have a huge negative reward, you will be in a hurry. If you have a small negative reward, you may not be in a hurry to reach the end. You'll do the same action regardless of time. The game does not end until we reach the absorbing state. If we do not have an inifinite time, and a short amount of time, we may want to rush through to get a positive reward. Gives non-stationary polices where states' utilities changes with time. We will be adding rewards using discounted sums. If we do not multiply by gamma, all the rewards would sum to infinity. When we multiply by gamma, we get a geometric series that allows us to multiply an infinite number of rewards to get a finite number. Also, the discount factor is multiplied because sooner rewards probably have higher utility than later rewards. Things in the future are discounted so much they become negligible. Hence, we reach a finite number for our utility. Guarantee that for every policy, a terminal state will eventually be reached. Utility is what we expect to see from then. This is not equal to the reward, R(s) for being in that state that is immediate. If you look at going to university, there's an immediate negative reward, say paying for school fees. But in the long-run you may have higher salary which is similar to U(s), a form of delayed reward. Utility, U(s) gives us a long-term view. This is the optimal action to take at a state. For every state, returns an action that maximizes my expected utility. Reward of that state plus the discount of all the reward from then on. U(s'): utility of another state. n equations: since we've n number of states. n unknowns: U(s') since we've n number of states. Update utilities based on neighbours (all the states it can reach).